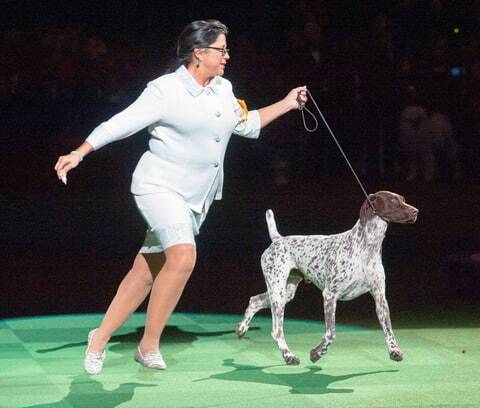 It’s all about a German shorthaired pointer named CJ which won “Best in Show” at the 140th Westminster Kennel Club (WKC) annual dog show that was held in New York on Tuesday. The beautiful German pointer bested more than 2,700 contestants over the two-day extremely tough competition. Westminster is considered to be the second longest continuously running sporting event that is held in the United States behind the Kentucky Derby. The spectacular sporting event drew entries from nearly 200 breeds and varieties and more than a dozen countries this year. CJ’s owner Valerie Nunes-Atkinson, from Temecula, California, said she just couldn’t believe it when she saw her dog achieving such a huge dream. CJ stood stoically by her side and was occasionally rewarded his favorite chicken treats. Nunes-Atkinson usually breeds German shorthaired pointers, which are medium-to-large size hunting dogs native to Germany. Despite having too many dogs of the same breed, she said she always knew GJ was a special one. CJ the champion of Westminster 2016 Dog Show will now head back home and celebrate the win with his best friend…a whippet named Ramona. After prancing across an expansive show floor at Madison Square Garden, GJ will also receive a trophy and later embark on a media tour as the show’s champion. A Borzoi, named Lucy, was runner-up. On the first night of the events, which was last Monday, Lucy the Borzoi won in the hound group, a flat-faced bulldog named Annabelle won in the non-sporting group while Rumor, a spirited German shepherd won in the herding group, and a silky-haired Shih Tzu named Panda won in the toy group. CJ won the sporting group, a Skye terrier named Charlie pulled the terrier group off, and a fluffy Samoyed, named Bogey, was the winner of the working group on Tuesday, the second and last night of the event. 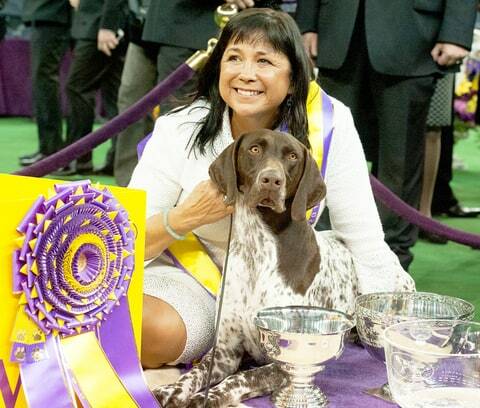 Last but not least, we would like to show you a video that was posted on Facebook by the American Kennel Club “Meet German Shorthaired Pointer Puppies And Their Breeder” celebrating the newest Westminster Champion and giving us all an insider’s look at how these wonderful dogs get started. The Most Delicious Dog Treats That Will Make Your Dog Go Crazy For It! List: 8 Instagram Accounts Of The Weirdest Yet Funniest Dogs You Will Ever See! Study Shows Most Pet Owners Love Their Pets More Than People In Their Lives!